I am sure by now you are more than aware that the Nordstrom Anniversary Sale started yesterday. I placed a large order yesterday and I can't wait for everything to arrive! The Nordstrom Anniversary Sale is a great time to either splurge on a designer piece or stock up on some pieces you will be able to wear multiple times. Two years ago, I splurge on some Tory Burch riding boots. I LOVE the ones that are included in this years sale. I have to say, I really think they are worth the money because mine still look brand new. This year, however, I just wanted to stock up on some basic pieces I would wear often. I got some new workout gear, Kendra Scott jewelry, and a couple other pieces. I was really impressed with the athletic clothing so definitely browse that if you haven't already. I don't plan to keep everything I ordered, but I was worried that if I took too long to decide then the stuff I did want would sell out, haha. With the free shipping and free returns policy Nordstrom has, it's really a no brainer. There are plenty of great items included in the sale this year, and what's even better is that many of them are less than $50! I rounded up some of my favorite pieces that are less than $50 in today's post. What is your favorite? I ordered two items in the above graphic for myself. Any guesses for what they are? Make sure you are subscribed to my YouTube channel because once I receive the items I will be doing a haul and sizing guide! Over the next few weeks, I will be included some of my favorite items from the sale at the bottom of each post. If you have a specific category you want me to cover, let me know in the comments. Nice rounding up the under $50 set. I joked about all the Nordstrom guides out there but they really do help and this is one of the best! happy weekend!! I didn't even think about checking their athletic gear! I'll have to go and browse that section! There really is a lot of really cute pieces included in the sale this year! I really love those halter tanks! I am loving that striped shirt! So many fun things on sale this year. Can't wait to shop it!! All of you enablers are going to get me in trouble with this sale! Lol. I want to buy everything I've seen! 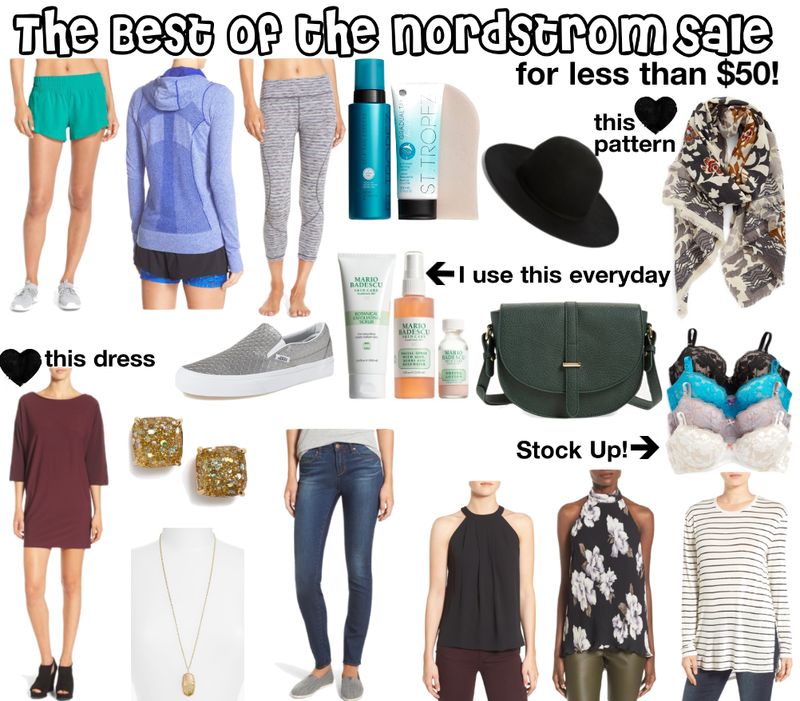 Perfect guide for Nordstrom lovers. I never go crazy at the Nordstrom anniversary sale but those Betsy Johnson bras have me intrigued and of course those adorable KS studs. So many great items from the sale! I'm heading there today! Everyone is raving about this sale and I'm staying far away! LOL! I do hear those Kate Spade earrings calling my name though! I am in love with some of the work out clothes - the capris you are showing are so cute!